Listed below are some websites you may find helpful. A brief description of the suggested websites is included. NOTE: Some links are to sites outside of the UC domain. No endorsement is intended of products, services, or information, nor is criticism implied of similar sites that are not mentioned. Website about children's books, parenting, and family issues. The American Library Association is the oldest and largest library association in the world. Its mission is to promote the highest quality library and information services and public access to information. Penn State Cooperative Extension provides educational materials, videos, and educational activities for child care providers, parents, and employers. Reading Rockets has developed a Spanish-language website devoted entirely to literacy. This site is targeted to parents whose first language is Spanish and to those who work with and provide services for ELL families. The site is in Spanish, but has an English sister version. It features parent tips and activities that build children's skills. The official Eric Carle website containing information about the author and his books and art. IRA was founded in 1956 as a professional organization of those involved in teaching reading to learners of all ages. This website is a pediatrician's guide to children's health and safety. Website for children based on the "Little Critter" book series by Mercer Mayer. Promoting excellence in early childhood education, NAEYC is dedicated to improving the well-being of all young children with particular focus on the quality of educational and developmental services for all children from birth through age eight. The First Five - Placer County Children and Families Commission website provides great resources for children, families, and services providers. Placer County's website...where you can find out what's happening in the community and much more. Reading is Fundamental (RIF) prepares and motivates children to read by delivering free books and literacy resources to those children and families who need them most. 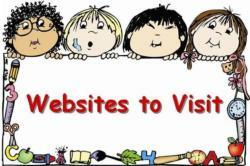 Choose this site to find out more about Rosemary Wells, her books, and her famous characters Max and Ruby. Information for parents and teachers. The Search Institute is an independent nonprofit organization whose mission is to provide leadership, knowledge, and resources to promote healthy children, youth, and communities. United Through Reading, formerly the Family Literacy Foundation, is a not-for-profit organization facilitating supportive relationships through family and friends reading aloud with children. Their vision is that all children will feel the security of caring adult relationships and develop a love of reading through the read alound experience. Zero to Three is a national nonprofit organization that seeks to advance the healthy development of babies and young children. Information on child development, activities, articles, tips, and publications for parents and professionals. It All Begins with a Great Book!